The scenery throughout Banff National Park in Alberta, Canada is spectacular, but this view of Cascade Mountain towering above the forests from Lake Minnewanka is breathtaking. The snow capped peaks of Cascade Mountain reach a height of 2,998 meters looking down upon glaciers, miles of alpine meadows and lakes. 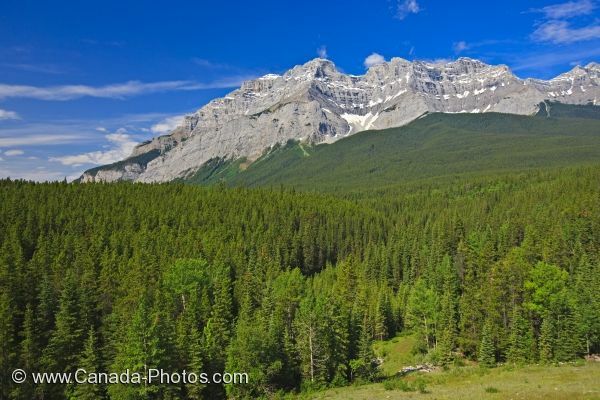 Many visitors to Banff National Park will spend their vacation mountain climbing to the peaks of Cascade Mountain where the scenery is unbelievable. Banff is one of the four National Parks, the other three being Jasper, Kootenay and Yoho, which surround and protect a majority of the Canadian Rocky Mountains. Cascade Mountain and the Cascade River Valley seen from Lake Minnewanka, Banff National Park, Alberta, Canada. Picture of the scenery of the Cascade River Valley and Cascade Mountain from Lake Minnewanka in Banff National Park, Alberta.